And miles to go before I sleep.—Robert Frost. Two days back we returned from Dharwad, and I put my phone off, I had promised my friend something and I could not make it. A little later I figured I was running away from myself more than from my friend. That’s when I figured the importance of promise. If I make a promise I need to keep it. When I set out to start the Toastmasters club at Goa, I noticed after the initial, gung-ho about my participation I seemed to be left out, of course I was angry, and then hurt. It was only when I was working on another project and I dropped a longstanding partner for her lack of honouring appointments I realized I was along similar lines. When this epiphany occurred I decided that any cost I would keep my word. That meant before committing I need to figure can I honour this word? That mean I needed to think of it from all aspects before I made a promise. A treatment plan I realized was also a promise. It had to be crafted with the patients, concern, need and comfort and a time schedule preferable a well in advance. Pricing also needed to discussed and agreed upon—not haggling please. If any changes need to occur then I Owe it to the patient to inform, discuss and create a new agreement. Like I said before this is possible only if make this promise to ourselves. Another common mistake we tend to do, we tend to put the 3rd person first, then the 2nd person and finally ourselves. “Some people don’t understand the promises they’re making when they make them,” I said. Here is something that helped me get my act in place, hope it works for you too. Try it out and give me a feedback. 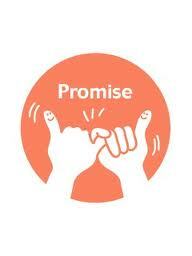 Promise yourself that you will keep the promise s you made. Carry a flash card that would say think first. If you have a problem in honing the promise then renew the promise according to the circumstances.